Local SEO expert Scott Brennan is giving several presentations on Local Search Optimization over the next several months throughout San Luis Obispo County and Santa Maria. 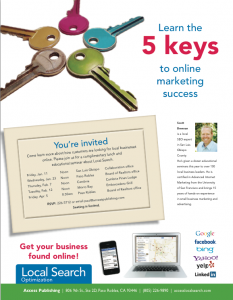 Business owners and managers are invited to come learn more about how to improve their online presence. Brennan has given over 20 educational seminars to hundreds of local business leaders at engagements from Chambers of Commerce to Rotary Clubs and service organizations. His company, Access Publishing, provides web design and local SEO services to over 80 businesses in San Luis Obispo County. 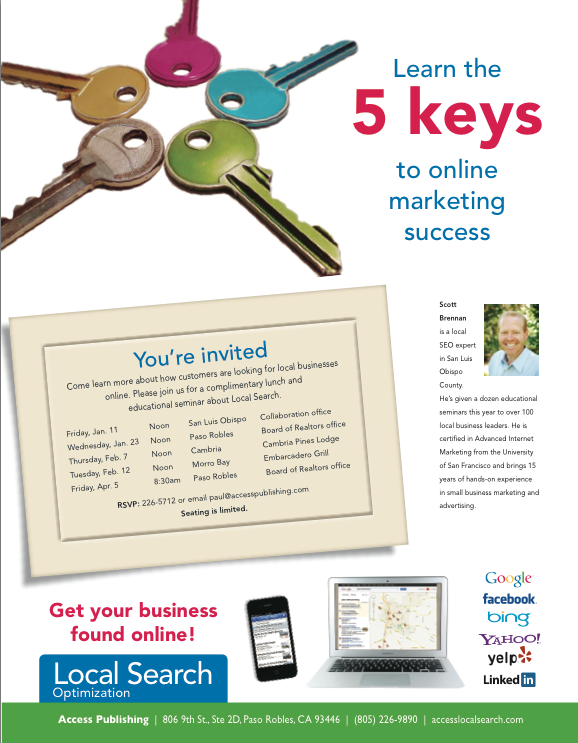 The upcoming presentations for Local SEO in San Luis Obispo County will help business people “Learn the 5 keys to Online Marketing Success.” The presentation is one hour and includes a complimentary lunch. Seating is limited. “We are helping small businesses create a high-ranking online presence to get them found by locals and we will be talking about how we do it,” says Brennan. 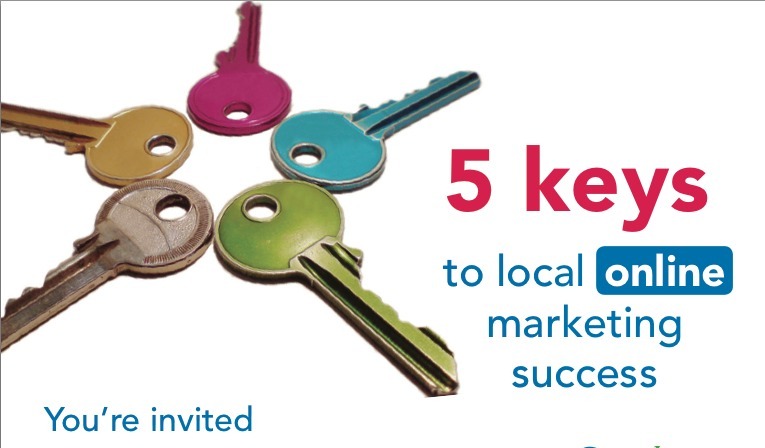 About Access Publishing: Access Publishing provides local business marketing solutions. It is a local leader in online marketing, Internet advertising, local search engine optimization, SEO, SEM, keyword-targeted web design, blog writing, print advertising and graphic design. Specialty services include Google mapping.